Pour flour, baking powder, and salt into a zip-loc and mix it very well. In a separate bowl, mix egg and milk. Pour flour mixture into bowl, stirring only until smooth. Place dutch oven lid upside down over coals - place two pieces of wood parallel on the coals and rest the lid on them to leave air space under lid. Pour some vegetable oil on the paper towel and wipe the lid to cover it in a thin film of oil. 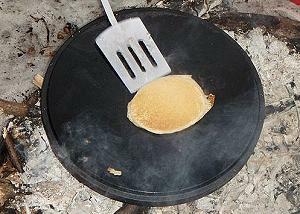 Pour about 1/4 cup of batter in the center of the griddle. Cook until brown and dry around edges with bubbles on top. Flip over and brown the other side. Makes 12-16 pancakes, depending on size. All recipes use a 12-inch dutch oven, unless specified. If you have a 10-inch dutch oven, use about 2/3 to 3/4 of the ingredient amounts but keep the temperature and time about the same. If no temperature is listed, use 350 degrees. for Frying, Stewing, Roasting, Baking, and Simmering. Let me know how you enjoyed your Pancakes! Send a photo of your meal to so I can add it here. Get 66 favorite recipes in my new dutch oven cookbook.